Some times, it takes a long time for Windows to perform the initial installation and configuration of USB and other PnP devices when booting systems. If it is performing the initial installation of the mouse and keyboard USB device, then you can't do anything during this period of time. 1) On the CCBoot server, enable the super client for a client PC (such as PC101). 3) Install the USB or other PnP devices. 4) Click the "Start" button, and in the "Run" edit box, type "regedit". 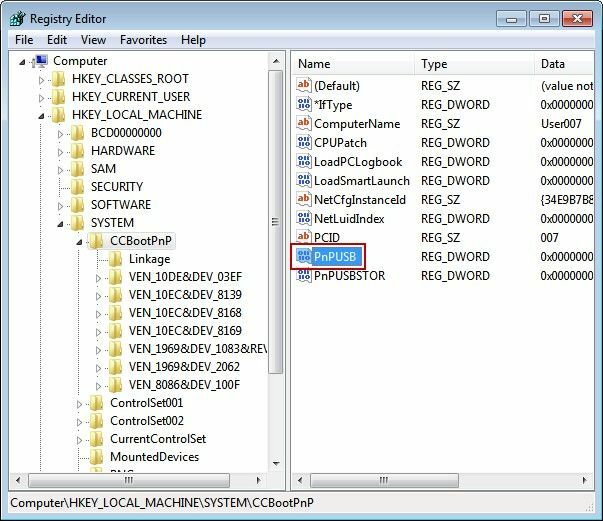 5) In the "Registry Editor" form, navigate to "HKEY_LOCAL_MACHINE\SYSTEM", and then click the "CCBootPnP", in the right form, double-click the "PnPUSB" (Figure 1-1). 6) It will pup up the "Edit DWORD Value" dialog box, in the "Value data" edit box, modify "0" to "1" (Figure 1-2). 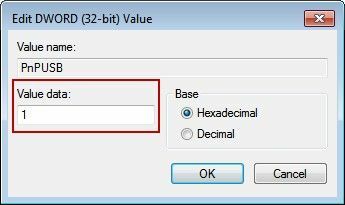 If it is the "USB disk" problem, you need to double-click the "PnPUSBSTOR", and after that, it will pop up the "Edit DWORD Value" dialog box, in the "Value data" edit box, modify "0" to "1". 8) On the CCBoot server, uncheck the super client.